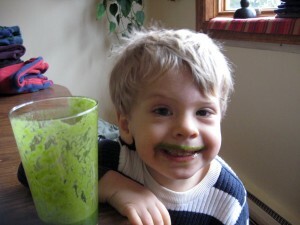 Vitamix Creations Review - "No Thanks" - Got Greens? Is the best deal from QVC? Vitamix Creations GC Galaxy Class (K36187), Vitamix Creations Turbo (K40173), and Creations II (K38242) Vitamix 12-in-1 are creating quite a stir. We have been receiving an overwhelming amount of questions about the QVC Vitamix blenders. This review will quickly help answer what the difference is between Vitamix Creations and 5200 Series. Learn why the Vitamix 5200 or Explorian E310 may be the better blender for you. Everyone loves to save money and many shoppers trust QVC as they have been on TV for quite some time. When on special, Creations blenders can sell at a lower price than a new Vitamix 5200 or E310 from Vitamix. Many people like that QVC offers a payment plan. Let’s review why many people think these are the same blender. The first thing to understand is that the “Creations Series” was created exclusively for QVC (and Vitamix is contractually obligated to advertise them on their site for a higher price). They are in fact based on the 5200 series blender. Both the Creations and the 5200 are Classic C-Series blenders with the same base and motor. There is NO difference in power or controls, the difference between models is only in package accessories and warranty. A note about power difference. There is a lot of rumors and confusion as to why the GC is “more powerful” than the 5200. When it was first released, the Creations GC was advertized as “the most powerful Vitamix made” because it draws 1 amp more power. After long discussions with Vitamix it was determined that this “extra power” of the motor was a result of the GC being the only home Vitamix at the time that had the cooling fan run constantly, no matter the speed, which therefore needed to draw more power. If you really want to get the most for every dollar then you MUST consider a Factory Reconditioned Vitamix direct from Vitamix and save at least $90. That’s $50+ LESS than QVC with the same warranty! (FYI a 3 yr extended warranty costs $120). Ultimately, if you have decided to invest in a Vitamix there is no wrong choice as every model available is an excellent blender built to perform and backed by amazing customer service and warranty. What do you like most about the model you chose? Eveline, “creamy” vs “frosty” really is just a matter of adjective. 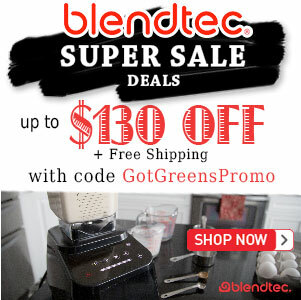 In our experience both Vitamix and Blendtec make amazing smoothies. In deciding between them, you should look at the features that are important to you. Please see our complete comparison of the two. The most useful blog about vitamix models so far 🙂 my question is: do i really need an extra dry container or you can also do the dry recipes with the 64oz one? Thank you Paula, we are so happy to help! You do not really need the extra dry container; you can do dry recipes in the standard containers. The difference is in the efficiency. The dry-grains container is designed specifically for blending grains and dry ingredients – If you were to do a lot of dry blending then the dry container could be worth it. See our dry blending review for more details. The Creations GC has a better motor than the 5200. It runs at 2.25 horsepower as opposed to only 2HP. That actually equates to a 12.5% increase in horsepower and an 8.69% increase in amperage. This is not insignificant! While I would prefer to get a commercial strength Vitamix such as the 3 HP Vita-Prep 3 with a retail warranty, apparently that is not whats available for “consumers”. It really aggravates me actually. Hello Nick, thanks for your feedback. The difference in power between the 2 models is due to running the fan all the time, there is no additional power to the blending motor itself. Both the GC and Vita-Prep have the continuous fan and therefore draw more power. 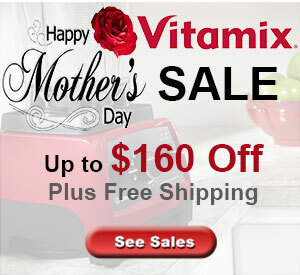 I just bought the vitamix creations ii on QVC for $399.99, 6 flex pays and free shipping. Plus, since I oredered now, return policy extended until the end of January.The 5200 is $450 and have to pay off in 3 payments. Not only that, but the 48 oz container from Vitamix is not the soft handle. That only comes on the 64 oz. container. The first one I received was defective. They didn’t charge me to return it and since it took a little longer to receive my replacement, I got a $40 credit back to my credit card! I choose QVC….it’s a no brainier! Thank you for your feedback Barbara, it’s good to hear you are a QVC fan. The point of comparing QVC with buying direct from Vitamix is that you can get the same blender with the same warranty reconditioned for $299 NOT $450 (price varies depending on sales but at most is $329). So for those who are looking for the lower price – the numbers do not lie. If you really need to stretch your purchase for 5 or 6 payments then QVC is a good place for that, when offered, where the Vitamix plan is only 3 payments. Also be sure to check on the QVC return policy – pretty sure you pay to return it regardless of how long it’s extended (unless it’s a defective/error exchange). What matters most is that you purchased a blender that you are happy with – Congratulations! May you have many happy, healthy years of blending. UPDATE: Vitamix now offers a 3 or 5 payment plan option. People who know QVC trust them and have experience with them. They get more colors which is important to some people for an appliance that will last. I did not know that buying from Vitamix directly means free return shipping (only if you want to return it) or a longer warranty. But sometimes QVC’s easy pay is 6 months and Vitamix offers only 3. They can see multiple presentations in their own homes from hosts and guests with whom they are likely familiar. They know QVC will take items back according to their policies. Trust is a big thing and they know QVC and they do not know Vitamix. That is the advantage to them. I had never heard of Vitamix before I saw it on QVC some years ago. So I do not think that it is dumb for people to buy it from QVC. You can also call QVC or email or post questions on Facebook and they will be answered. They reach customers Vitamix does not so I am sure it is worth it to them to sell on QVC. There are pros and cons to anything and people do what is best for them or what is handy for them. Many do not use a computer and cannot watch videos, etc. QVC may be their only source to see it. I have seen it since I joined Costco a while back but just happened to catch it and that model (with some timed options) cost far more than I paid. Now that I happened to run across your site and have been on the company site todsy,(which I had a lot of problems with and had to email them-I could not register, sign up for email, add to cart, etc. and I tend to just leave a site and never come back if I have problems) I will look around and compare more before buying another one or an accessory from QVC. But if it was important to me to get a certain color or price then I would still buy from QVC. The turboblend VS that I might buy if I needed one now is over 150.00 more than what I paid!!! Since I live in Pittsburgh PA which is about a 3 hour drive from Ohio, I may go to one of the factory sites and see their other models so I can consider the professional ones and other accessories. If I had known what I now know I might have bought direct instead but I am not sorry I bought it from QVC. Also, QVC sometimes has free shipping with a Today’s Special (lasts 24 hours and may offer free one way shipping at other times. That is when I bought mine (TS and free shipping) and when I bought my KitchenAid appliances too. I got the exact same colors in my mixer, food processor and Vitamix which I really like. Rarely use any of them but I like having them when I decide to use them. Will be using my Vitamix more now that I have decided on an even more strict diet-gluten free. Now that I saw the Vitamix on QVC I know I can make gluten free flours and knead dough so I will use it more. So QVC has been a good information resource for me. I will be buying the dry container sometime soon because of QVC’s presentation today. Thank you for sharing your experience. We greatly appreciate it and your feedback is helpful to other readers. I am glad to know that the information was helpful. Sounds like you got what you needed, let us know if there is anything else we can help with. I’m confused. You say here that it is the same motor, but the Vitamix web site says the Creations GC is a 12.5 amp/2+HP motor while the 5200 is a 11.5 amp/2 HP motor. How can that be the same motor? Thank you for your comment. It is confusing. We attempted to clear it up above. Essentially it is the “same” motor. In an attempt to make the Creations GC “the most powerful Vitamix” at the time it was first released on QVC, it became a 12.5 amp motor. Whether it was specifically for marketing purposes or only to distinguish it further as a unique QVC offering is unknown. After much discussion with Vitamix, it was our understanding that the only difference between the 5200 and GC motor is that the GC motor has the fan run constantly (it is the only residential Vitamix blender to do this prior to the release of the Vitamix 7500). In order to accomplish this, more power is required. Does that 1 amp of more power make a difference in performance? Is there a difference between 2+ hp and 2.2 hp? While there is no published data available to answer that question, our personal empirical experience from comparing the GC to the 5200 has shown no discernable difference whatsoever. Our guess is that the GC motor was the prototype to the 7500 motor to test having the fan run all the time. I hope that helps to clear things up for you. What’s the difference between having a knob to grade the speed and not having one? Is one machine better than the other ? I know that the warranty is different that aside will I be able to do the same things with both? The Vitamix you purchased from QVC is a two speed version of the 5200 – it basically has a low and High speed switch. The variable speed dial of the 5200 allows you precise control of the speed. One isn’t necessarily better than the other; it is mostly a preference of how you want to use your blender (and cost for the additional feature). Ultimately, they perform the same and you will be able to do the same things with both. Some owners really like the control of the 5200 while others are happy with just 2-speeds for less cost. Every video I watch (for the 5200) says, “turn On. Turn variable speed to 10. flip switch to High.” So the variable speed for me is useless! Maybe someday I’ll come across a recipe that uses it, but not yet. Enjoy your blender! I just bought my second one (first a 5200 and now a refurb from the “C” line – they don’t tell you which one but I just got it today and it says “Creations II” on it. I like that it is red! Just made my first smoothie in the new one, works just like my 5200 – which I gave to my parents). Thank you for your feedback Katrina! We use the variable speed most of the time. It is especially useful for making chunky salsa. It is also useful when blending thick purees to prevent cavitation. Enjoy your Vitamix! Hello! Im undesicive about which model to buy! Whats the difference between all the models?? Luz, with so many models, it can easily get overwhelming. Are there any particular models you are comparing? Which one to buy often depends upon how you plan to use it. Feel free to contact us here for continued conversation if you prefer. My question is if all models are able to make nut butters? Yes Beatrice, all Vitamix models can make nut betters. Yummy nut butters! looks as though it has different recipes. Jean, at this time the Creations recipe book is included only with Vitamix Creations models and not available separately. Just ordered a reconditioned 5200 and was disappointed to receive the Creations GC (frown)! Is it really the same machine? That’s just not right, is it? I am thinking of sending it back. Help? Larry – it is pretty much the same machine. It can be confusing. The Creation series is a model produced specifically for QVC (but also sold on Vitamix.com). Some people have been over-joyed because they received a Reconditioned Creations GC thinking it is better than the 5200 because it was sold on QVC and draws a little more power to run the cooling fan all the time. Notice that when you order a “Reconditioned Vitamix” it is not necessarily a “5200”, the label on the base can vary. But by all means you should be 100% satisfied. Call Vitamix before you send it back. I just received my Vitamix, however, included was less than a postcard-size info sheet providing information about the “old cap” and “new” cap so I called you, and was transferred 7 times before I was finally transferred to “Chia”. She seemed to have an answer before I asked, she is very professional, informative and I felt that you should know that she is an asset to your business. I ordered a reconditioned Vitamix and guess what? I received a Creations GC! HA! Exact same blender for a better price and a better warranty. I looked at the vitamix 3 payment plan. In the first payment you have to pay 50% of the cost of the maching on the second payment it’s 25% and third payment is 25%. I choose QVC because of the power payments. I agree! Not everyone can afford to pay 50% up front. That’s why QVC flex pay offers people the opportunity to own a Vitamix who normally couldn’t afford to pay so much up front. If you gotta pay over 6 payments you have to think about whether you can afford the purchase at all, no? I cancelled my order at qvc and purchased from vitamix. I got the reconditioned 5200. I didnt want to make payments for nearly half a year. It really is like brand new and I love it. I use it several times everyday. I made only 3 payments to vitamix and… presto! its paid off! The warranty length is a major factor, but QVC’s payment plan makes it a lot more do-able for some of us. I’m buying this because of a recent liver inflammation, so waiting an extra month to save up half the money to pay directly to Vitamix, rather than QVC, is a consideration, too. Thank you for this, it is exactly what I was looking for. was trying to decide between the QVC version and the 5200. Now the decision is easy – Vitamix 5200 all the way! Thanks!